relatives are aware of the situation. Please also make sure children and the infirm can get to shelter on short notice. There is a "high" chance of violent, long-track tornadoes as well as 4" diameter (!) hail. 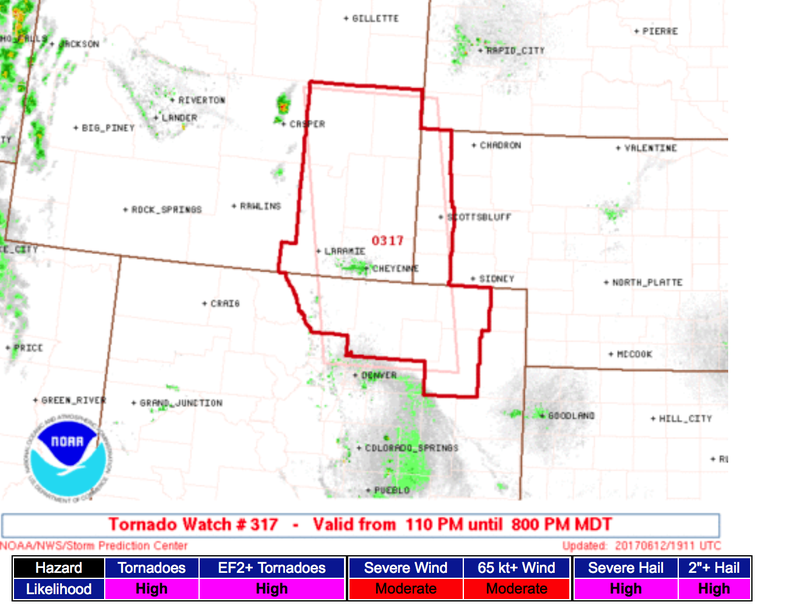 The watch includes Ft. Collins, Sterling, Wheatland and other cities in addition to the ones listed. It is vital you monitor the weather situation if you live in the tornado watch area. PDS = "particularly dangerous situation" tornado watch. 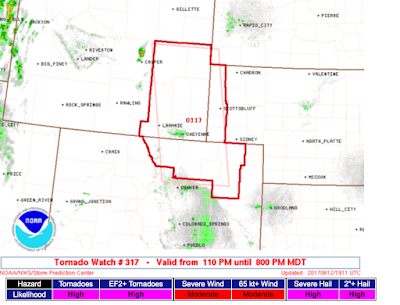 It is in effect until 8pm MDT. The town where I pastor was hit by an EF 1 that day & there was a long track EF 2 north of town. I was at home in a town 16 miles to the east of my church town. We didn't get a drop of rain that day. It was three days before I could get back to the other town. The good news is that everyone pretty much heeded all the warnings & were in shelter by the time the two separate tornadoes hit. I don't think anyone received any injuries at all in the storms themselves.